Apple's HomePod aims to further expand Siri assistance outside of iOS devices, Apple Watch, Macs, the Apple TV Remote and AirPods into the same sort of "always ready" home experience delivered by Amazon's Echo, even as it upgrades audio reproduction quality in the emerging "smart speaker" segment into the realm of affordable luxury. 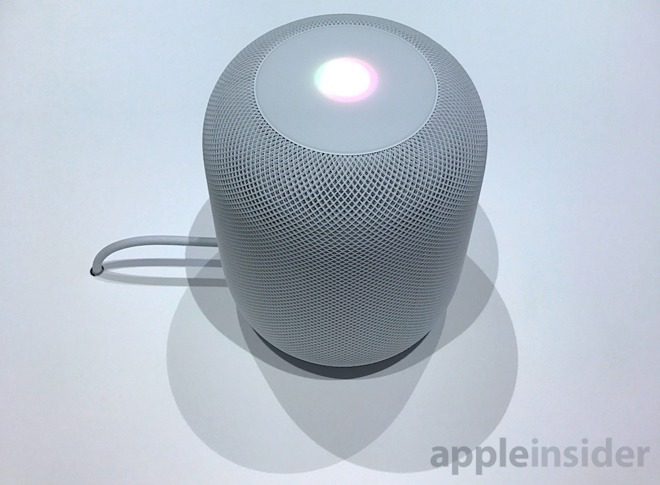 I was able to listen to a prototype of Apple's new HomePod audio device, both playing on its own and in concert with a second HomePod unit. For its compact size (it's barely larger than a stack of CD-R discs, if you recall what those were), the new device unveiled today at WWDC17 as Tim Cook's "one more thing" sounds impressively wide and powerfully deep. An out-of-the-box Sonos (which is a wider, more conventionally shaped speaker box) and Amazon's Echo (a taller, skinnier cylinder) both reproduced the same songs with less passion. They are both also cheaper devices than the $349 HomePod, but compared to a smartphone or tablet, the price difference here is far less than the premium that people pay for a real iPhone or iPad. For a typical room, a single HomePod puts out plenty of sound. But more than quantity, it clearly is targeting quality audio reproduction. The device includes a large-for-its-class 4 inch woofer for deeper bass surrounded by 7 directional tweeters for higher frequency treble. In comparison, Amazon's Echo has a 2.4 inch woofer, barely larger than its tweeters (or a typical PC or clock radio). Walking about the room, HomePod sounded consistently immersive all over, while other reference speakers sounded not just smaller and flatter, but also more obviously directional. Rather than sounding like a home speaker, HomePod made me feel like I was sitting in a luxury automobile surrounded by rich, engaging audio reproduction without an obvious source. Beyond speaker size and sound positioning, there's also a third element to HomePod's sound reproduction: it packs sophisticated processing power (an A8 chip) to perform audio analysis and adjust reproduction matched to the music it's playing. This enables it to deliver clear vocals and create a pretty impressive separation between the crisp, directional elements of a song and the fullness of rich, ambient sounds. Older home stereo systems relied on less brains but larger speakers, taking up a lot more space to deliver comparable sound. Apple is betting that its customers will see HomePod as an ecosystem-integrated way to deliver premium sound in a small package. It "just works" with iOS 11's AirPlay 2 for streaming audio to multiple speakers in different rooms (each with an independent volume level), and it can also be paired with another unit to deliver an even wider stereo experience. Listening to a live acoustic concert reproduced by two HomePods makes you feel like you're close to the stage. Of course, that also becomes a $700 experience, on the higher end of the mainstream budget for home speakers. However, the units can also be easily moved around, enabling buyers to fill their home with multi-room audio and then pair two units in one room for special events. Apple hasn't yet revealed a variety of details about the new product yet, including how it is configured or how its fiber mesh is cleaned. Apple's Beats subsidiary already sells a popular Pill Bluetooth speaker line that suggests answers to those questions (and has already popularized the idea of using multiple speakers, as depicted above in a music video). I haven't yet got to add it to a HomeKit configuration (speakers are a new device type in iOS 11's Home app), nor used Siri on HomePod, although Apple claims it can hear Siri commands spoken at conversational volume even while music is playing. That sounds similar to noise cancelation--it knows what it's playing, so it can simply subtract that from what it hears to discern your voice. There's also questions about recognizing the voices of multiple users and other details, all of which will have to wait until the product is ready for release. One observation: unlike AirPods, the HomePods I listened to featured volume controls on top, allowing you to turn the unit up and down without asking Siri. 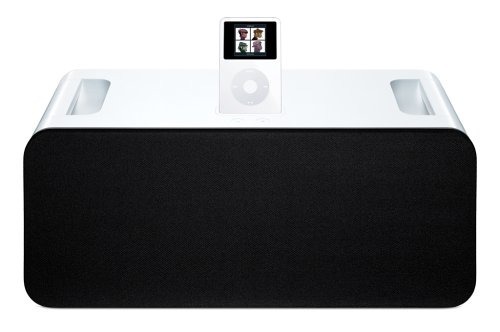 It's also noteworthy that just over ten years ago, Steve Jobs introduced the identically-priced iPod Hi-Fi, Apple's ill-fated portable speaker that used a Dock connector, mini audio jack and optical TOSLINK input to play music from various sources in the era before AirPlay and Bluetooth. It featured an even larger 5.12 inch woofer, as well as a large resonating cavity that made it significantly larger than a breadbox (if you recall what those were). iPod Hi-Fi didn't work with all of Apple's devices and faced more direct competition for wired playback in an external enclosure. In the years since it was discontinued as a flop, Apple acquired a major audio accessory manufacturer and gained a lot of understanding about how to sell audio accessories and what buyers want. Additionally, newer technologies including Siri and wireless playback also offer the potential to make HomePod a more desirable product offering compared to iPod Hi-Fi. It is clear that Apple's entry into "revolutionizing" home audio doesn't follow the same script as Amazon's Echo (oriented around learning about what products you might want to buy and influencing you to conveniently order them) or Google Home (which wants to learn more about to you to sell you on advertising). It's closest to other popular wireless speakers such as Sonos, but includes some tighter links to the iOS ecosystem. HomePod also departs from Apple's previous audio products, ranging from its early iPod to its latest AirPods: it puts music first, focusing on sound quality. A common complaint about iPods was that they weren't for "audiophiles," and critics similarly jumped on AirPods for delivering invisible earbud-quality sound rather than aspiring to deliver the reference audio of studio headphones. Both of those products were designed for mobility, convenience and the freedom of music choice rather than just the best possible audio reproduction. HomePods aim to expand Siri from your devices and CarPlay vehicle into your home, so it makes sense that Apple is focusing more on sound quality here. It appears to have nailed that differentiation over other smart speaker options. It remains to be seen whether Apple will also improve Siri to be equally useful (or better) than Google Assistant or Amazon's Alexa. 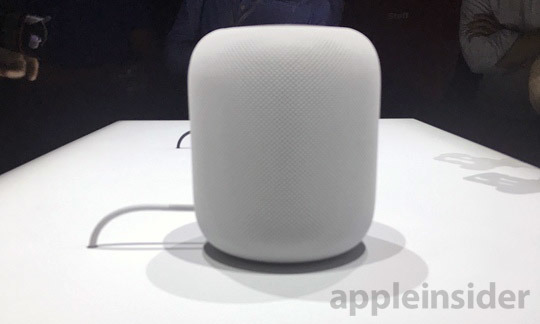 But with more powerful hardware, HomePod has a strong edge over its competitors, which appear to be focused on finding volume sales of low-priced hardware. Given that Amazon and Google have yet to sell more than a few million smart speakers, HomePod certainly has the opportunity to be the next Apple Watch in claiming yet another new "smart" territory for Apple.